Hyperbaric oxygen has been widely used in the treatment of chronic osteomyelitis during the past few decades. However, a clear appraisal of its effectiveness is lacking. The aim of this study was to systematically review and evaluate published studies on the overall efficacy and possible complications of hyperbaric oxygen for the treatment of chronic osteomyelitis. A systematic review of the literature was performed according to the Preferred Reporting Items for Systematic Reviews and Meta-Analyses guidelines.17,18 The following databases were thoroughly searched: Medline (via PubMed), Web of Science, the Cochrane Library, Embase, Ovid, Google Scholar, and the World Health Organization International Clinical Trials Registry. The search methodology was performed using the following combination of terms: “chronic osteomyelitis [all fields],” “hyperbaric oxygen [all fields],” and “treatment [all fields].” The titles and the abstracts of the studies were identified and reviewed independently by 2 of the authors (O.D.S., A.K. ), who used predefined criteria to select the relevant publications. 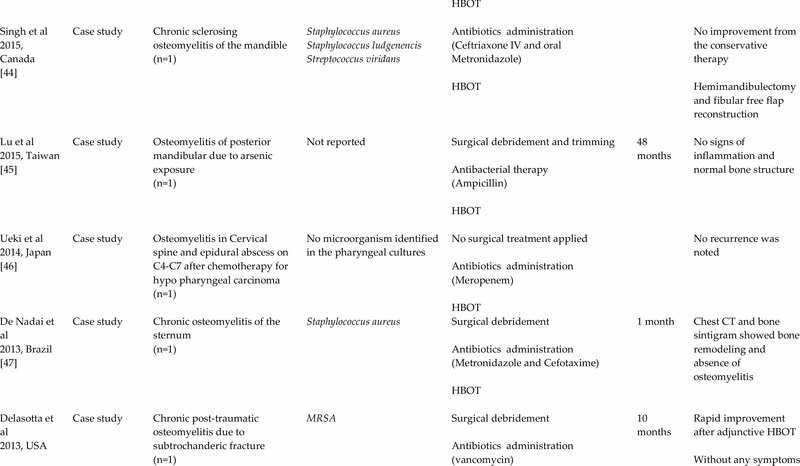 Inclusion criteria were as follows for the human studies: (1) an appropriate description of the etiology and pathogenesis of the disease; (2) reporting of the pathogen associated with chronic osteomyelitis development; (3) description of the treatment and follow-up protocol used; and (4) reporting of the final outcome of the therapeutic approach (ie, success vs failure). Case reports were reviewed and are reported separately from other types of studies. All articles in English published in peer-reviewed journals were considered. Articles in languages other than English, literature reviews, technical notes, and letters to the editor or expert opinion publications were excluded. 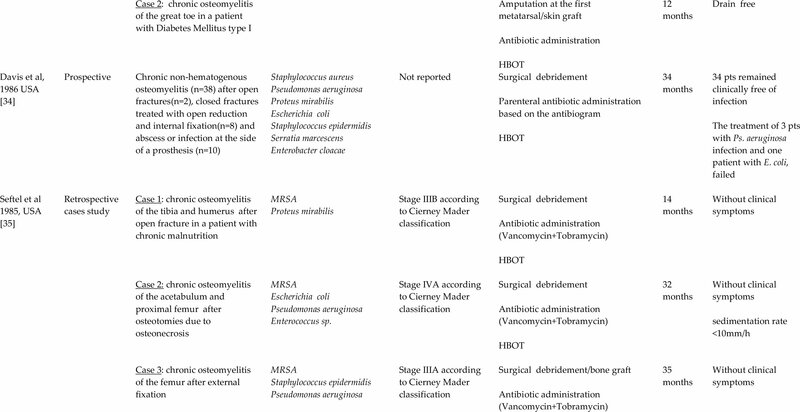 Articles with insufficient details regarding type of infection, therapeutic procedure, follow-up, and clinical outcome were also excluded. For further minimization of selection bias, all articles were reviewed a third time and then assessed and discussed by all of the authors. If a disagreement occurred regarding the inclusion and exclusion criteria, the senior author (S.T.) made the final decision. Data extraction was performed and data were recorded independently by all of the researchers. 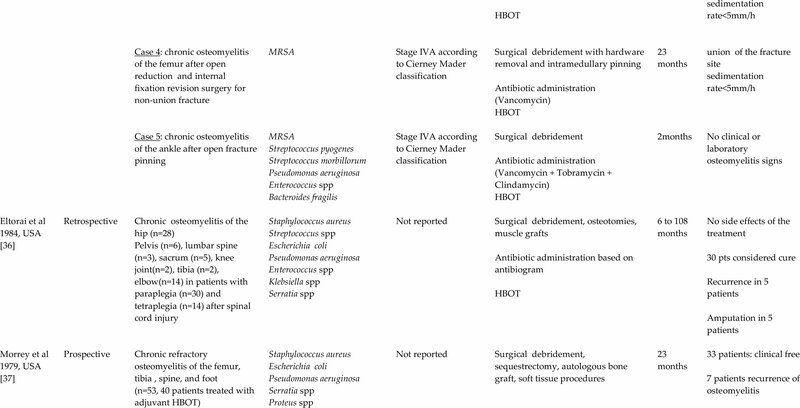 Study design, demographic characteristics, surgical intervention, causative microorganism, disease severity, and treatment effectiveness and safety were recorded. Animal studies were examined separately from human studies. The literature search and cross-referencing resulted in a total of 96 references. On evaluation, 51 articles were excluded and 45 articles were retained. 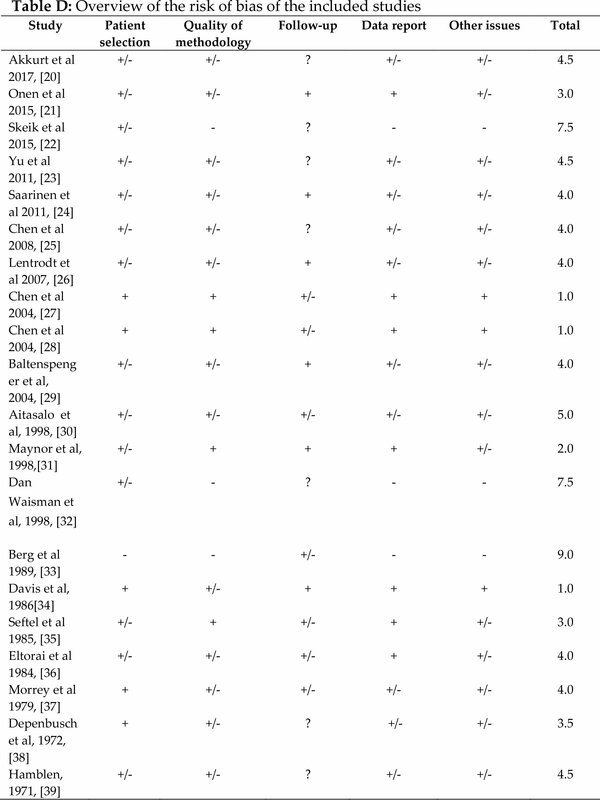 These consisted of 14 retrospective and 6 prospective cohort studies (Table A, available in the online version of the article),20–39 20 case reports (Table B, available in the online version of the article),40–59 and 5 animal studies (Table C, available in the online version of the article).60–64 The included studies were published between 1971 and 2017. Overview of the causative agents, classification, interventions, follow-up and outcome of the included case studies. Twenty cohort studies and 20 case studies examined the effectiveness of hyperbaric oxygen for chronic osteomyelitis. A total of 460 patients treated with hyperbaric oxygen were identified. Overall, 308 (73.5%) of 419 patients with complete data had a successful outcome and no reported relapse. Only 4 studies reported the grade of chronic osteomyelitis according to the Cierny Mader system, classifying 3 patients as having grade II, 26 patients as having grade III, and 30 patients as having grade IV. In addition, only 1 study described the severity of the concurrent pedal ulcers with the calcaneal chronic osteomyelitis in diabetic patients based on the Wagner classification, with 11 patients having grade II and 12 having grade III. The follow-up period was reported in 27 studies, being a mean of 28.3 months (range, 1–108 months). The anatomic locations of chronic osteomyelitis, in order of frequency, were as follows: (1) the mandible (62 patients); (2) the tibia/fibula (58 patients); (3) the spine (32 patients); (4) the jaw (30 patients); (5) the hip joint (28 patients); (6) the femur and the calcaneus (23 patients each); (7) the sternum (16 patients); (8) the elbow (14 patients); (9) the pelvis (6 patients); (10) the chest and the humerus (5 patients each); (11) the foot and the ankle (3 patients); (12) the sinus and the temporal bone (3 patients); and (13) the knee joint (2 patients). In 2 studies, the exact location was not clarified. In 3 patients, chronic osteomyelitis developed in more than 1 site (Tables A–B). 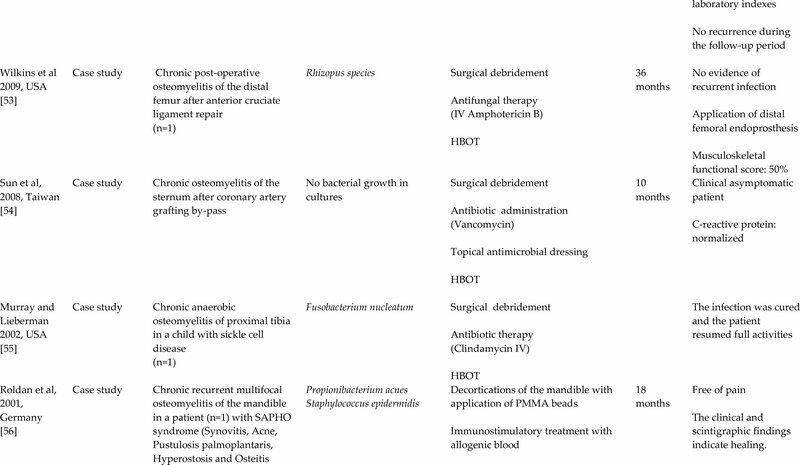 Sixteen cohort studies2,21–23,27–31,33–39 and 19 case studies40–43,45–48,50–59 reported increased rates of successful treatment when combining hyperbaric oxygen with intravenous antibiotics and surgical debridement. Three studies reported the resolution of chronic osteomyelitis with hyperbaric oxygen plus surgical intervention20 or hyperbaric oxygen plus antibiotic administration.26,32 Two studies reported that the extra hyperbaric oxygen application did not improve the results of surgical and antibiotic treatment.24,49 In 1 case study, where no surgical intervention was undertaken, hyperbaric oxygen did not lead to any clinical improvement.44 In 29 (6.3%) of 458 patients, failure of the hyperbaric oxygen treatment was reported.20,22,24,25,27,28,34,37,49 In 20 (4.4%) of 458 patients, recurrence of chronic osteomyelitis was observed. All of the studies were either prospective or retrospective case series or case reports. Compared with randomized clinical trials, these study designs are prone to selection bias. Only 1 study used a control group.23 No study tested the outcome statistically. The mean quality assessment score of the studies was low, indicating that their quality was fair. The weakness of the methodology quality and the low assessment score indicated increased risk of bias. There were not significant differences between the mean values of the scores estimated by the 2 examiners. The summary of the potential biases is presented in Table D, available in the online version of the article. To the best of the authors' knowledge, this is the first systematic review focusing on the impact of hyperbaric oxygen in the treatment of chronic osteomyelitis. Despite the fact that the design of the studies included in this review was not optimal to identify the efficacy of hyperbaric oxygen for chronic osteomyelitis, it appeared that the combination of hyperbaric oxygen, intravenous antibiotics, and surgical debridement led to remarkable improvement in clinical and laboratory findings in both animal models and human studies. Experimental models evaluated in this study used Staphylococcus aureus as the implicated pathogen (ie, the main pathogen evaluated in most human studies). Staphylococcus aureus is known to be a significant pathogen in chronic osteomyelitis. 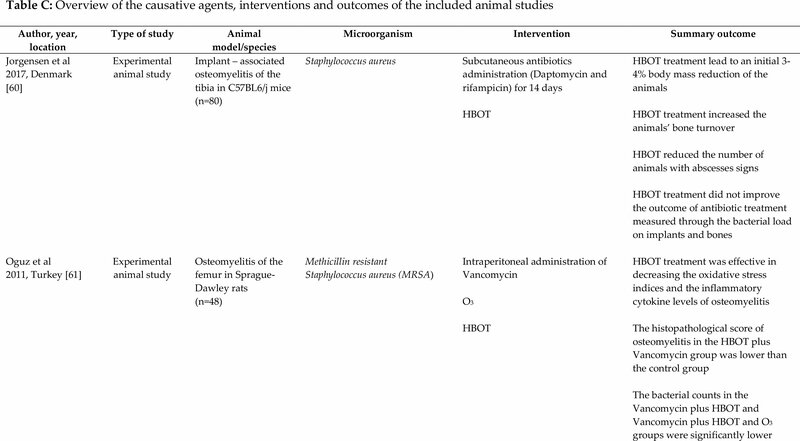 In animal models, hyperbaric oxygen was always used in combination with antibiotics61,64 or ozone.61 Effects on local and systemic inflammation were highlighted in some of these experiments as mediating the therapeutic effect of hyperbaric oxygen. Hyperbaric oxygen not only reduced the histopathological score and the bacterial count of chronic osteomyelitis but also decreased the oxidative (malondialdehyde, superoxidase dismutase, and glutathione peroxidase) and inflammatory (interleukin-1ß, interleukin-10, and tumor necrosis factor-α) indices.61 However, these effects could work both ways; in some reports, hyperbaric oxygen was associated with either a delayed improvement of outcome with antibiotic treatment60 or bacterial growth stimulation62 in implant-associated chronic osteomyelitis. Nevertheless, in implant infections, surgical debridement probably has the primary therapeutic role. In addition to adjuvant hyperbaric oxygen, other factors, such as the secure immobilization of the infected area27,28 and the removal of the infected implants, may contribute to a successful outcome in difficult cases of chronic osteomyelitis. The combination of hyperbaric oxygen, antibiotics, and debridement35 with full or partial removal of internal35,48,53 or external20 fixation devices and hardware23,30,37,47,50,52,54,57 was correlated with increased clinical improvement. The exact contribution of hyperbaric oxygen in such cases, which are almost always complicated by biofilm development, is difficult to elucidate. In vitro studies have shown that hyperbaric oxygen can be used as an adjuvant to ciprofloxacin on biofilms caused by Pseudomonas aeruginosa, enhancing the bactericidal activity of ciprofloxacin.69,70 Although there is an increasing acceptance of the advantages of hyperbaric oxygen on biofilm infections, its use remains controversial. Cost-effectiveness issues may counteract the beneficial effect of adjuvant hyperbaric oxygen for chronic osteomyelitis identified in this review; no studies exist regarding this. Compared with standard of care treatment, adjuvant hyperbaric oxygen therapy was cost-effective in studies of its therapeutic use for diabetic ulcers.73,74 In these studies, hyperbaric oxygen therapy correlated with an increased quality-adjusted life years index and a lower proportion of major amputation. When considering financial gains for a relatively expensive therapy, direct and indirect medical costs need to be addressed, such as savings in wound dressing materials, hospital admissions, travel, and rehabilitation. These have been favorably affected in diabetic ulcer and chronic wound studies.75 Treatment for diabetic ulcers and treatment for chronic osteomyelitis have many similarities. The major limitation of this review was the heterogeneity of the included studies, which made their accurate comparison difficult. More specifically, great variability in treatment protocols, selection criteria, and follow-up periods and missing classification of disease severity and statistical analysis of the outcomes and recovery rates were observed. Other limitations of this review included the large number of case reports, the low level of evidence, and the small number of patients in the included surveys. Finally, a significant amount of the data were derived from studies before 2000. Thus, considerable information about the current treatment protocols is lacking. Hyperbaric oxygen appears to be a safe and potentially useful adjunctive intervention for the management of chronic osteomyelitis of various etiologies. 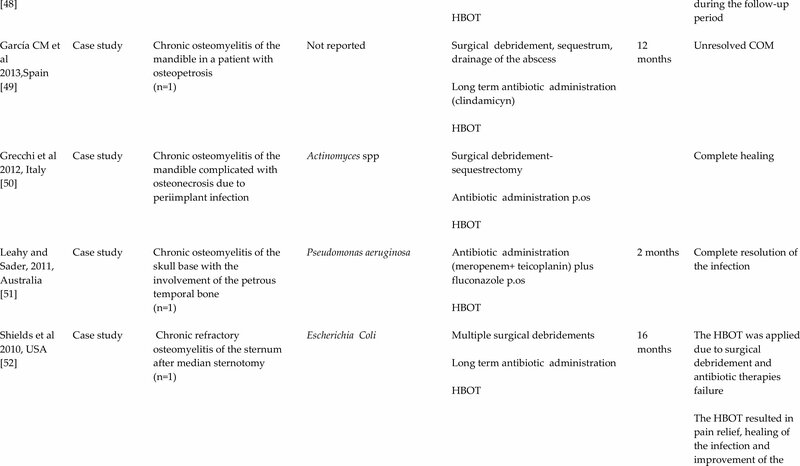 Hyperbaric oxygen combined with other important therapeutic interventions, such as antibiotics and/or surgical debridement, was associated with high recovery rates of chronic osteomyelitis, especially when followed by a secure stabilization of the bone and removal of the infected implant. Nevertheless, quality data regarding this finding are scarce. Randomized controlled trials should be conducted to investigate the efficacy of hyperbaric oxygen for chronic osteomyelitis. Salvana J, Rodner C, Browner BD, Livingston K, Schreiber J, Pesanti E. Chronic osteomyelitis: results obtained by an integrated team approach to management. Conn Med. 2005; 69(4):195–202. Higgins JPT, Deeks JJ. Selecting studies and collecting data. In: Higgins JPT, Green S, eds. Cochrane Handbook for Systematic Reviews of Interventions Version 5.1.0. London: The Cochrane Collaboration; 2011. Chen CE, Ko JY, Fu TH, Wang CJ. Results of chronic osteomyelitis of the femur treated with hyperbaric oxygen: a preliminary report. Chang Gung Med J. 2004; 27(2):91–97. Chen CE, Shih ST, Fu TH, Wang JW, Wang CJ. Hyperbaric oxygen therapy in the treatment of chronic refractory osteomyelitis: a preliminary report. Chang Gung Med J. 2003; 26(2):114–121. Maynor ML, Moon RE, Camporesi EM, et al. Chronic osteomyelitis of the tibia: treatment with hyperbaric oxygen and autogenous microsurgical muscle transplantation. J South Orthop Assoc. 1998; 7(1):43–57. Sheftel TG, Mader JT, Pennick JJ, Cierny G III, . Methicillin-resistant Staphylococcus aureus osteomyelitis. Clin Orthop Relat Res. 1985; 198:231–239. Eltorai I, Hart GB, Strauss MB. Osteomyelitis in the spinal cord injured: a review and a preliminary report on the use of hyperbaric oxygen therapy. Paraplegia. 1984; 22(1):17–24. Morrey BF, Dunn JM, Heimbach RD, Davis J. Hyperbaric oxygen and chronic osteomyelitis. Clin Orthop Relat Res. 1979; 144:121–127. Hamblen DL. 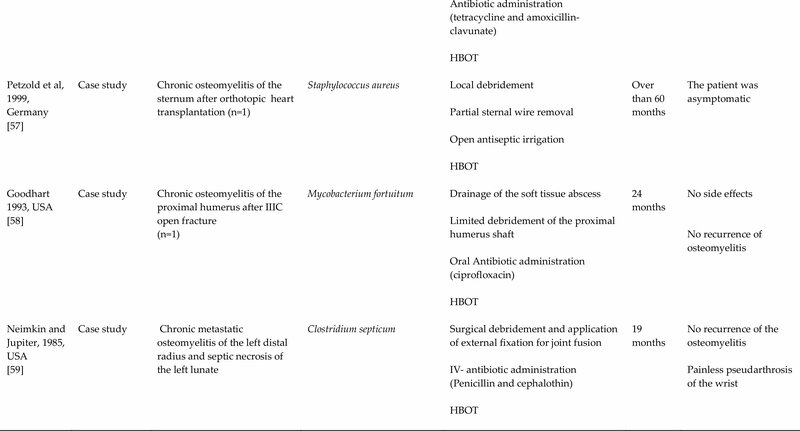 Hyperbaric oxygen in treatment of osteomyelitis. Proc R Soc Med. 1971; 64(12):1202–1203. Ueki Y, Watanabe J, Hashimoto S, Takahashi S. Cervical spine osteomyelitis and epidural abscess after chemoradiotherapy for hypopharyngeal carcinoma: a case report. Case Rep Otolaryngol. 2014; 2014:141307. Grecchi F, Zollino I, Candotto V, et al. A case of mandible osteonecrosis after a severe periimplant infection. Dent Res J (Isfahan). 2012; 9(suppl 2):S233–S236. Sun IF, Lee SS, Chiu CC, Lin SD, Lai CS. Hyperbaric oxygen therapy with topical negative pressure: an alternative treatment for the refractory sternal wound infection. J Card Surg. 2008; 23(6):677–680. Mendel V, Reichert B, Simanowski HJ, Scholz HC. Therapy with hyperbaric oxygen and cefazolin for experimental osteomyelitis due to Staphylococcus aureus in rats. Undersea Hyperb Med. 1999; 26(3):169–174. Gesell LB, Trott A. De novo cataract development following a standard course of hyperbaric oxygen therapy. Undersea Hyperb Med. 2007; 34(6):389–392. Vanholder R, De Smet R, Jacobs V, et al. Uraemic toxic retention solutes depress polymorphonuclear response to phagocytosis. Nephrol Dial Transplant. 1994; 9(9):1271–1278. Feldmeier JJ, Heimbach RD, Davolt DA, Brakora MJ, Sheffield PJ, Porter AT. Does hyperbaric oxygen have a cancer-causing or -promoting effect? A review of the pertinent literature. Undersea Hyperb Med. 1994; 21(4):467–475. Roldan et al, 2001, Germany  Case study Chronic recurrent multifocal osteomyelitis of the mandible in a patient (n=1) with SAPHO syndrome (Synovitis, Acne, Pustulosis palmoplantaris, Hyperostosis and Osteitis Propionibacterium acnesStaphylococcus epidermidis Decortications of the mandible with application of PMMA beads Immunostimulatory treatment with allogenic blood Antibiotic administration (tetracycline and amoxicillin-clavunate) HBOT 18 months Free of pain The clinical and scintigraphic findings indicate healing. The authors are from the First Department of Orthopedic Surgery (ODS, IKB, GDC, SDG, PJP) and the Fourth Department of Internal Medicine (ST), National and Kapodistrian University of Athens, School of Medicine, “ATTIKON” University General Hospital, Athens; and the Laboratory of Molecular Pharmacology (AK), School of Health Sciences, University of Patras, Patras, Greece. Drs Savvidou and Kaspiris have contributed equally to this work and should be considered as equal first authors. Correspondence should be addressed to: Olga D. Savvidou, MD, PhD, First Department of Orthopedic Surgery, National and Kapodistrian University of Athens, School of Medicine, “ATTIKON” University General Hospital, 1 Rimini St, 12462 Chaidari, Athens, Greece ( olgasavvidou@gmail.com).